Well, it is almost midnight and I am just getting to this post..but it IS still Friday, and where Suzy, who I am joining for Flashback Friday lives, it is only 9:30! What a wonderful occasion to celebrate.. Thanks for visiting.. Be sure to visit Gollum for Foodie Friday, and Suzy at Kitchen Bouquets for Flashback Fri..
Just in the nick of time Cinderella.... hehe. Love the little soups. Did everyone get three or did they have to pick? I love your little tall cake you do. What size pan is that? Cute Cute bride and groom. Thanks for joining me for the Flashback!! Suzy, I used 3 of those 6 1/2 in disposable pans if I remember.. They picked one soup, but were welcome to come back and try another.. 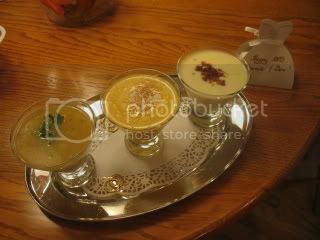 Your soups are delicious and look so pretty in those little glasses, happy weekend, Kathy. You always have such great ideas. The soups look so tasty and the cake looks adorable. Unique way to serve the soup. I have to remember this for my cooking light club in the Fall. Thanks for sharing. What a presentation for the soup - cool! The cake looks yummy - what kind is it? Kathleen, I remember "hearing" about your friends 50th. 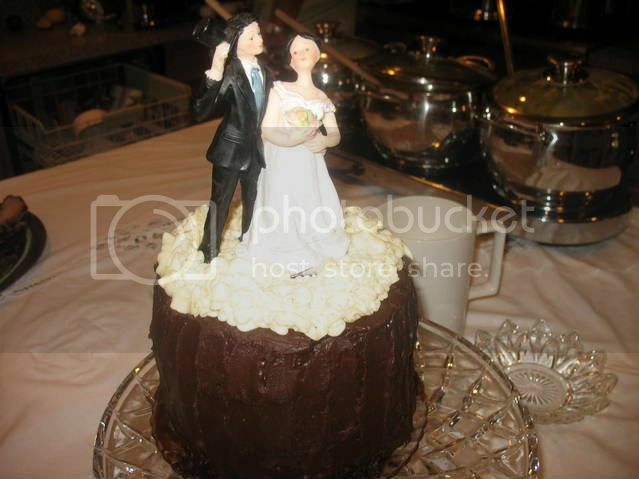 What a lovely presentation for the soup; and the cake looks delicious ... cute couple on top. I adore the soup in the cosmo glasses! I'm considering a soup and appetizer party for next Christmas, and this will go into my 'food memory bank' as an idea. Your soups sound grand, and your glasses are as cute as can be for that use! Great idea! I might just have to pinch that one. And oh, if I lived near a WS Outlet, I would have to take in ironing to support my addiction! I like the idea of serving soup in the cosmos glasses. Love the soups! 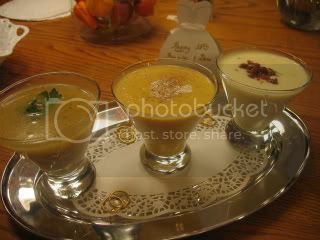 Love those little soups and what a great presentation. Chicken fried steak is usually from round steak -- pounded thin, then dipped in flour, egg, flour and fried! Sometimes it is deep fried! What an elegant way to serve the soup! I love that idea! The cake looks delicious! What a wonderful hostess you are and I remember this party well. The soup in the glasses is such a good idea and your cake is too cute. Since it was pre-blogging you will have to show your beautiful tablesetting from the party someday as a flashback. Sounds like a lovely party and very elegant with your presentation of soups. The cosmo glasses are a great idea.